Armorers is a Disciple of Hand class that specializes in crafting. 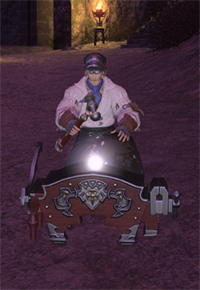 If you don't know the basics of crafting, I recommend that you check our FFXIV Crafting Guide to learn some of the basics. Armorer's (ARM), as you may guess by the name, enjoy the art of crafting armor! If you are starting the game with a class that can wear plate (Lancer, Gladiator, Maraduar), then leveling an Armorer early in the game can prove beneficial. You could craft armor as you gain levels and save a lot of money and level crafting at the same time. Armorers also can craft primary tools for Alchemists (ALC) and Culinarian (CUL). Armorer's require A LOT of Ice Shards, so be sure to stock up on those. I would recommend leveling a Botanist (BTN) to level 20 to learn "Menphina's Ward" and use it on nodes that allow an additional attempt, which should yield 15 shards. Farming shards is pretty annoying, but will save you a lot of gil in the long run. I usually farm and do other gathering while I'm watching TV, which helps. Leving an Armorer, or any crafting class, can be exhausting, so it is recommended to save your leve allowances to spend on tradecraft leves. You can learn more about leveling your Armorer and locations of levequests at our FFXIV Armorer Levequest Guide. You will begin to notice some common and repeatable ingredients needed to craft for your Armorer. Here is a list of the most commonly seen ones, so be mindful of this as it may be beneficial to level a gatherer to help obtain this material. Here is a list of items that an Armorer can craft and specialize in. This is good to know in case you are leveling another class and want a crafter to make items for, or to make end-game gil. Here is a list of some of the end game, one and two star craftable items that armorers can make.